Many of the projects I carry out require powering in some way and in many cases this is needed away from a mains supply. To stop having to recreate power leads and connections for every new project, I adopted a standard system that I have continued to use until this day. All projects are run on either a nominal 12V or 24V- this reflects using automotive or other standard low voltage parts and industrial process control parts. Early on I standardised on using 3 pin XLR style connectors for a number of reasons- they are cheap, they are robust, they are compact, they come with a locking feature, they will handle up to 15A and they are available in a selection of cable and panel mount types. Additionally I had acquired quite a few second-hand ones, so they started out free. Other options have been considered and discounted. In particular I do not use cigarette lighter plugs and sockets as they provide no locking and are bulky and not very robust, Caravan plugs also have no locking feature, and do not have good cable mount sockets. Industrial low voltage (ceeform derived purple connectors) are very expensive and not widely available compared to XLR. There is a possibility of confusing these cable with microphone or speaker cables when using them on stage as these connectors are widely used in professional audio systems. I have never found this to be a significant issue; most of my need for these system has been for Scout events, away from a stage and so this hasn’t been a primary concern. On occasions where they have been used on gigs, this also hasn’t been a major issue due to a number of reasons; Cable is obviously a different colour and type to mic or speaker cables, many are labelled at connectors, and these systems are used by exception and so are rigged and cabled by a suitably competent person. Finally there is usually separation from sound systems- these items tend to be run near lighting kit, not in proximity to sound equipment. Croc- Clips- To connect to batteries. Power is supplied from a number of different sources, depending on the application. Bench power supplies can be used, but I tend to only do this when experimenting. The main supplies I use are a home-made dedicated 12V supply made from lighting transformer, in a box with rectifier, fuses and XLR sockets. I also have a 12V AGM battery housed in a home-made wooden box, and with a circuit breakered output (using scrap aircraft breakers), switches and XLR sockets. The 24V supply I use is a small industrial 24V supply, mounted in a box with a mains connector, fuse and XLR outputs. Some of the projects I have used these systems to power are elsewhere on this site, but in addition I have quite a lot of more generic parts built for general use. These include various lighting items, control switches- push button & radio controlled part, release solenoids, a bell etc. 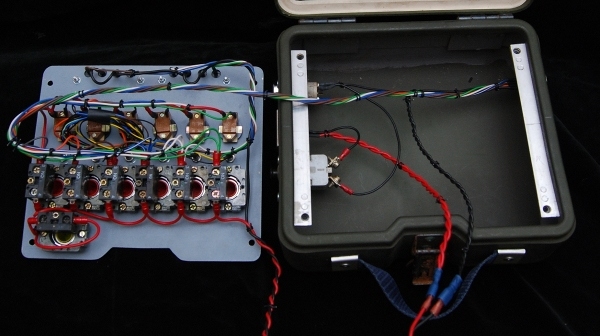 A ‘Firing box’ has also been constructed to control multiple outputs. 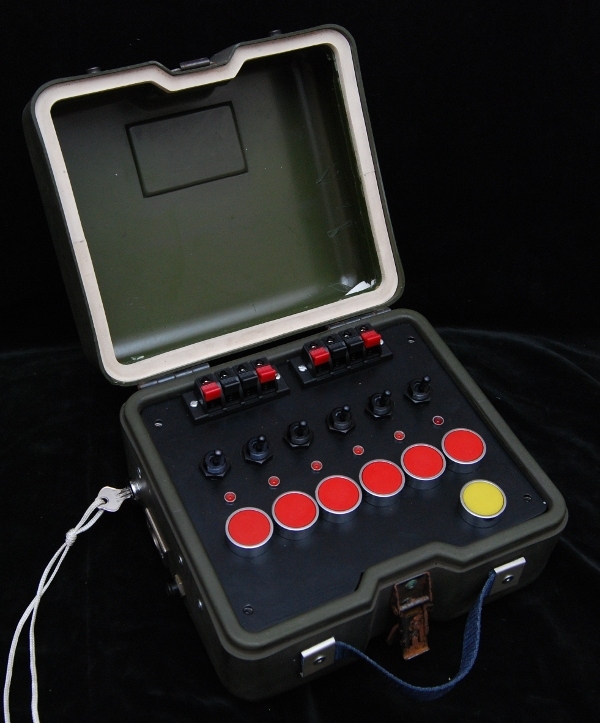 This control unit was built particularly to control a couple of confetti cannons I have built. The intention is that the unit can be used to control any low voltage units. 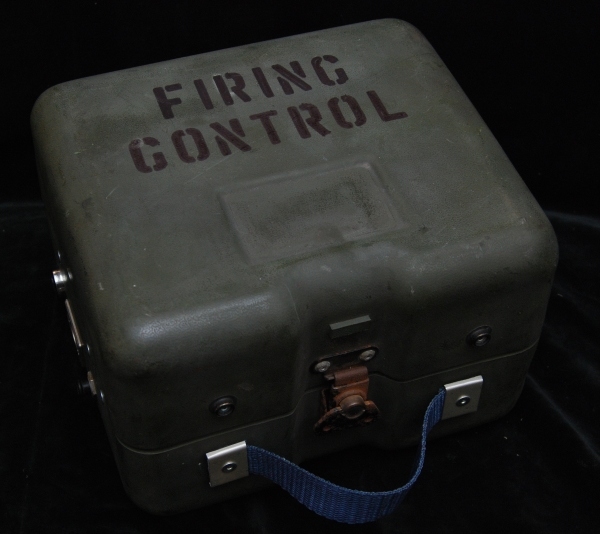 It consist of a box that used to contain a gunsuight, fitted out with a number of switches salvaged from surplus or scrap equipment. An aircraft circuit breaker and XLR socket along with key switch allow the unit to be isolated and protected.